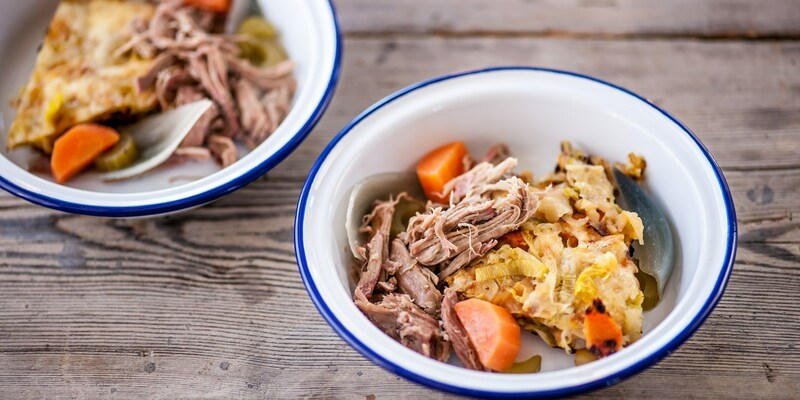 Slow cooking is ideal for getting the most out of tougher cuts of meat. Cooking on a low heat over a long period of time and submerged in a liquid results in succulent meat with rich flavours. Pork is perfect for slow cooking on account of its unctuous and tender flesh. Here we give a recipe for slow-cooked pork shoulder. Try flavouring the cooking liquor with chinese five spice, ginger and chilli for an Asian twist or for a more Caribbean feel, add Scotch bonnet chillies, cinnamon and allspice. The water can be replaced by chicken stock or wine for additional flavour. Josh Eggleton serves his slowed-cooked pork shoulder with bubble and squeak while Marcello Tully slow cooks many different cuts of pork in his Brazilian Feijoada.